I have been in something of a soupy mood all this month. Food just doesn’t warm me up the way a nice steaming bowl of soup does. You will have noticed that most of the soups I have been making, including my older cream of broccoli or the latest spinach soup have been the very epitome of simplicity. And yet they all pack a punch and in some cases are so filling that we make a meal with a bowl of soup and some garlic bread. Or if there are leftovers from the previous day’s meal, but not quite enough for both of us, then a big bowl of soup added to the meal does the trick. So Yay! for soups, for helping me survive this winter! The clear chicken soup with lemongrass and veggies that I shared with you a while ago, as also today’s soup, both call for a vegetable stock. Well, it’s very easy to buy the stock of course (though even the low sodium varieties are still very high on sodium as far as I am concerned). I remember that my mother never used to buy stock but used to make it at home by chopping up vegetables and giving them a good boil and a long simmer. But that always left behind a bunch of soggy boiled vegetables, which we didn’t know what to do with. It seemed a shame to throw away food, and yet they were extremely boring to the palate and having to eat them much diminished our excitement about the soups. (Soups were special then, because we mostly had them when we ate out, which wasn’t often, or on special occasions). While a good vegetable stock will add flavour to any soup, it is especially important in clear soups, where you add fewer vegetables and those that you do, you want to retain some crunch. 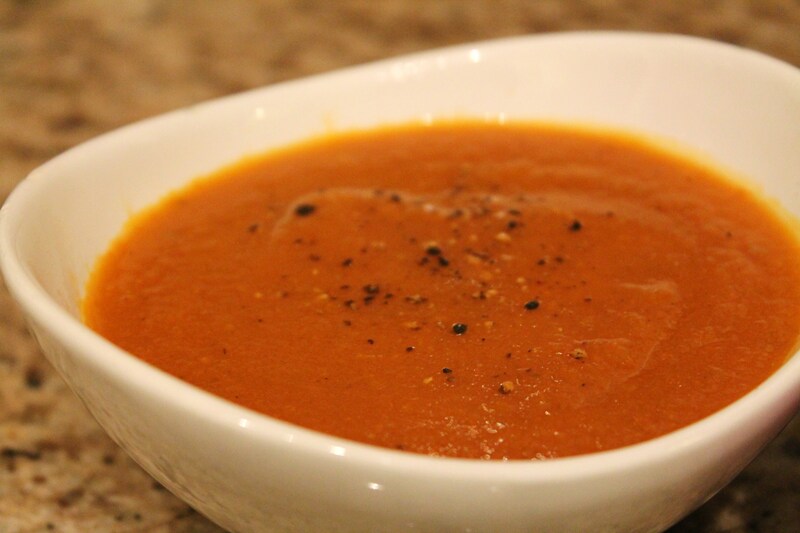 The stock can be substituted with water in some thick creamy soups, but this Carrot, Apple and Ginger doesn’t have a variety of vegetables in it and it is much better when made with a stock. Which brings us back to the question of which stock to use. I have been making my own stock for the last few months using a trick I found on the internet. I’m afraid I can not remember where I read it first, but I found it on multiple websites with some variations. The trick is to use vegetable peels and trimmings. Gasp! Don’t be shocked! Most vegetable skins are wholly edible and in fact when we throw away the peels, we also throw away some nutrients, not to mention a whole lot of flavour. Every time you peel potatoes or carrots or white gourds / squash (lauki) or onions, save the peels in a ziplock bag in the freezer. The freezing helps lock in the good stuff. Add to it the trimmings of caulifower, celery, french beans or really anything you can think of. I also add some stalks (not too many) or coriander to each batch. Go easy on the tomato though, because it can add quite a bit of acidity to the stock. I also don’t add any cabbage because the smell puts me off. Just be sure to scrub the vegetables clean before you trim/peel them to remove all traces of dirt. When the freezer bag is full, put the vegetable trimmings into a large pot, fill it up with water, throw in a bay leaf or two and some peppercorns, bring it to a rolling boil on high heat and then cover and simmer for a long time till the liquid is reduced by a third. You might want to add salt now or leave it for when you use the stock in a soup. I sometimes like to reduce it even further so that I can store it in fewer bottles and then I dilute it when I use it, because I still haven’t tried keeping it unrefrigerated. In the fridge, it keeps very well for 4-5 weeks. There are even tips on the internet for reducing it to less that half the original quantity and then freezing the stock in ice trays and then storing the stock cubes in a freezer bag. I haven’t tried that yet, so let me know if you have. So anyway, coming back to our simmering pot, turn off the heat when the stock is reduced to the desired quantity, let it cool and then strain and store in clean glass bottles. Refrigerate. And now today’s soup. I saw these gorgeous Indian carrots, the red ones in the grocery store and I just had to get a bunch even though they were rather pricy. The boring bland orange carrots that we get everywhere here are just no pleasure to eat. The red variety we get back in India has infinitely more flavour and winter, when they are harvested, is the best time for eating them. So I instantly started planning what I would do with them and while I thought about the it, my bunch diminished as I chomped on them raw. By the time I settled on this soup, which by the way is adapted from Oh She Glows, I had only half the bunch remaining and it had to be supplemented by its poorer cousin. And to be fair, the soup isn’t bad with just the regular orange carrots either, so don’t despair when winter is over and there aren’t any red carrots to be had. The addition of the apple gives a nice little twist to the flavour and the ginger adds the fire. Use a tart variety of apple like the Granny Smith, if you can. Heat the olive oil in a deep saucepan and saute the onions and the garlic until the onion turns translucent. Add the chopped up carrots and continue to cook for about 5 minutes before adding the apple pieces and the grated ginger. Mix well and cover and let cook for a few minutes. Add the stock and a good dash of pepper, turn up the heat and bring to a boil. The lower the heat and simmer for about 10 minutes, stirring once in a while. Turn off the heat and let cool. Once it is cool enough to handle, puree it in a blender. Return to the saucepan, add a bit of water or stock if it’s too thick and season with salt and more pepper if needed. Turn the heat on to medium high and bring to a simmer. Rashmi…this soup looks yummy and interesting…and your detailed method of stock preparation is just hearty for me as I simply hate throwing away the near-dead veggies. I am just wondering, how would be the flavour in soup with apple? Isn’t it sweeter as we don’t like sweet flavour in food supposed to be savoury (hate!! resto style paneer butter masala frankly). Thank you, Rashmi. The recipe only calls for one apple for a whole bunch of carrots, so no, it doesn’t really get sweet, but if you want to avoid whatever little sweetness that the apple might add, you could use a sour/tart variety like the green Granny Smith. Also, there’s plenty of ginger and pepper to balance it out. Give it a try. I must look up your cook book then! I shall try freezing the stock now that I have confirmation. I used to make a similar soup, just replacing the carrot with pumpkin..and in the end, added a cup of fresh orange juice..aah it was yum! !